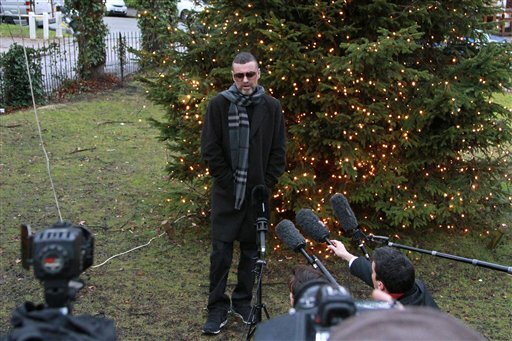 (CBS) George Michael said he may not be alive today if it weren't for the doctors at a hospital in Austria. The British singer met with reporters outside his London home on Friday to discuss his ongoing recovery from a life-threatening bout with pneumonia. Michael, 48, revealed that things were very "touch and go" for a while, reports the Associated Press. He thanked the staff at Vienna General Hospital for keeping him alive in the intensive care unit. "I got streptococca-something ... It's a form of pneumonia and they spent three weeks keeping me alive basically," he said. Michael appeared weak, gaunt and was short of breath while speaking with the press outside his home, according to published reports. Michael entered a hospital in late November, forcing him to cancel his European tour. At the time, tabloid reports suggested that Michael was suffering from a potentially fatal illness, but his spokeswoman dismissed the rumors. Michael now says his reps "played down" the seriousness of the situation so not to worry fans.